I scooped up this lightweight embroidered sweater last week, and have already worn it twice. I love the bright red-orange* color and it's super airy which is great for summer. These jeans on the other hand. Ugh. I typically love Paige Denim, but these stretched out so strangely and I haven't been able to get the ripples to go away, so don't buy them. My $5 Forever 21 clutch on the other hand, you might need. 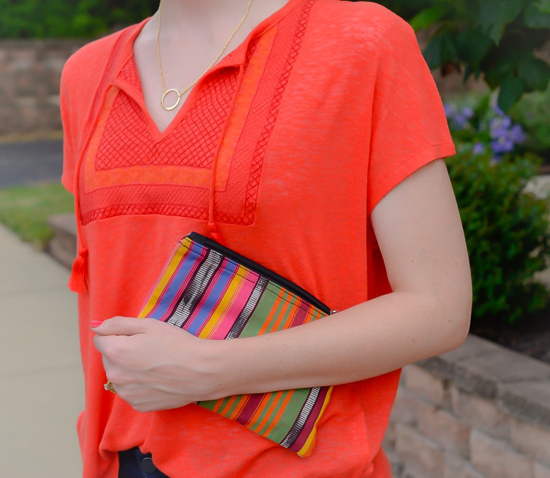 I have one that serves as my chapstick and lady products bag within my purse and it's the perfect size, AND it comes in a bunch of fun ethnic-looking textiles. Hope everyone had a lovely Monday! *Useless tidbit of information for the day-- there is actually a difference between orange red and red orange (I mean there's a reason Crayola makes both right?!) Orange red is more reddish, because orange is the adjective modifying red. So by that same logic, red orange is actually more orange. Don't you just feel enlightened? 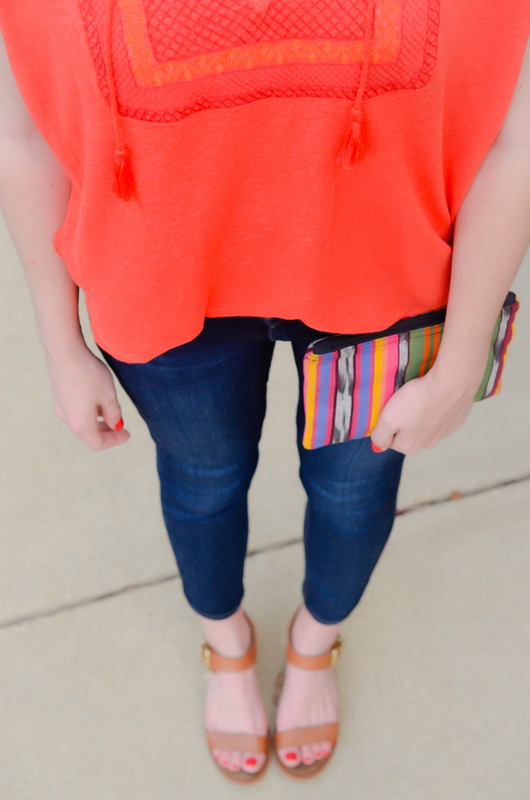 Very pretty color on you and adore that clutch! Jenna you're gorgeous, as always:) I miss teaching with you and seeing you every Sunday! I hope you love your new place and new ward!